Organized squatter groups have become “normal” in the last few years. From the rural areas to the largest cities, they take what they consider to be idle lands or unoccupied infrastructures, based on their constitutional rights to work the land or to have proper housing. 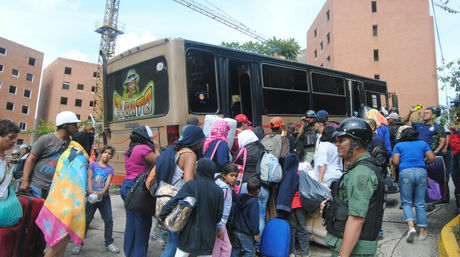 One NGO that represents urban land owners have calculated that at least 20,000 squatter invasions have taken place in Venezuela in fourteen years. Twenty. Thousand. Let that sink in. Two buildings were taken over by squatters in Western Caracas on Monday, almost at the same time. Sure, a clinic was working in one of the buildings and a small shop in the other, but illegal occupants didn’t care about that. In the outskirts of the capital, the situation isn’t much better: in the Altos Mirandinos, there have been thirteen failed attempts at squatting so far in 2013, according to reports of the Miranda State Police. But behind the claims of their right for decent housing lies the fact that squatting has also become a pretty good business for some folks. After all, extortion is a proven money-maker. Leaders demand money from owners in exchange for a peaceful withdrawal. As they come to the sites in large groups that include women and children, the chances of a swift eviction are reduced drastically… especially for groups identified with “the process”. But in some cases, when the authorities are deliberately passive or they’re simply overwhelmed by squatters, it’s up to the locals to be alert and prepared to take a stand.